Sprawling over the first two floors of a magnificent building & comfortably sleeping up to four people, this flat is ideal for groups and families alike. Located just a short walk from both Ladbroke Grove, Latimer Road & White City stations, experiencing the wonders that London has to offer couldn't be easier! Shops, bars & restaurants are just a few minutes down the road & Westfield Shopping Centre is 10 min away. The flat is well decorated, comfortable & modern with all amenities including TV, dishwasher, washer & central heating. There are comfortable double beds in each of the bedrooms and our cleaners place fresh, hotel quality linen on the bed just before your arrival. The sun drenched lounge room is well decorated and has comfy couches and a dining table The kitchen is fully equipped with all utensils if you feel like having a home cooked meal. The bathroom has a shower over the bath. 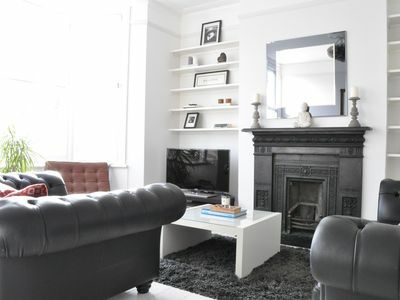 A fully equipped flat with everything you need for a short or long stay in London.